Last year I had so much fun getting ready for the Holidays. I love Christmas, but I don't like how they start advertising it earlier and earlier every year. It's not cool to start displaying Christmas things when we haven't finished celebrating Halloween. What's up with that? To me, it's like ordering an appetizer at your fav restaurant, and 5 seconds later your entree's come out! BLAH! My family is coming over to our house for Christmas again this year (probably because they had such a great time at our house last year :)) This is how I rolled out the red carpet for my guests last year. 2. COOKIES!! Every party needs cookies. I wish I can say I bought these cookies and displayed them at my party, but DISNEY always out do's any one's cookies. I had cookies from BJ's, but I am seriously thinking of making these cookies for our Christmas party this year. I'm pretty crafty, so we'll see how it goes! If anyone wants to share a gingerbread cookie recipe with me, please, please let me know! 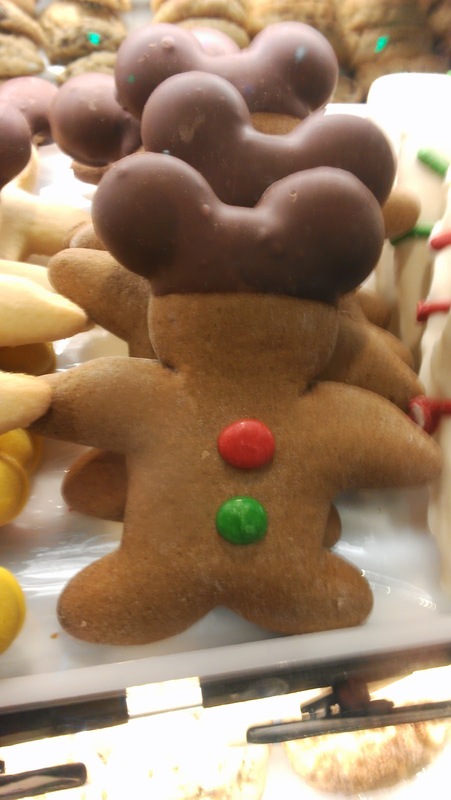 I really want to make these cookies into mickey gingerbread cookies. My families really picky, and always very apprehensive whenever I make anything. Which ticks me off, because I cook better than any them...lol I want to trick them this holiday season, and tell them "I bought these cookies" when really I baked them. So when they actually eat them, and like them...I'll be like BOMB I made these cookies you bunch of HATERS....LOL Help a sister out guys! I need to prove these women wrong this year. 3. BREAD!! This is a picture I took of a bread I make every year around this time. I love it! It's easy, and delish! 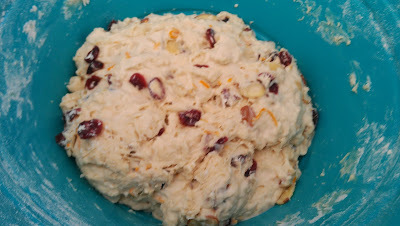 This one is called a Cranberry Orange Crusty Bread. I promise I'll share the recipe soon! If you have a French Oven, and don't like to kneed bread, then this recipe is the one for you!! 4. The tree. I take great pride in my tree every year! I'm all about the bling, and pop so the tree always mirrors that. This year, I added so much more to my tree. 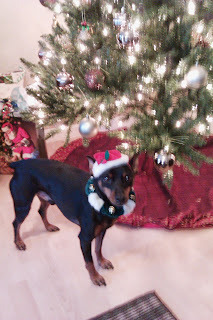 We do have a fake tree, but only because I'm too frugal to buy a real tree every year. It's a waste of a perfectly good tree, and a waste of money. 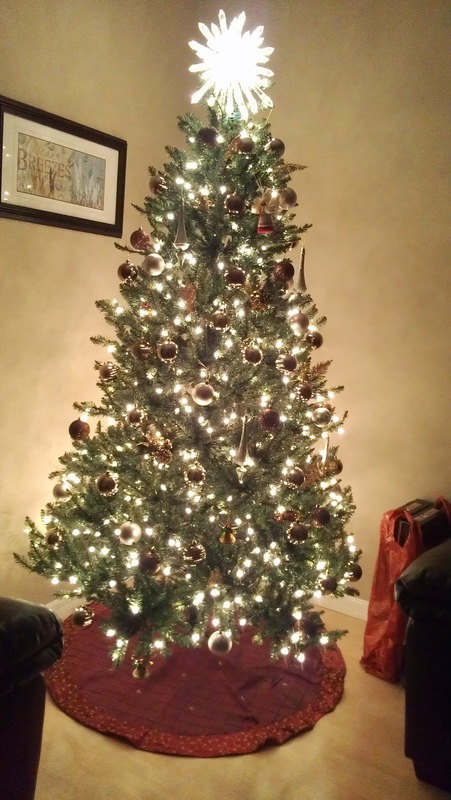 Real tree's that about the same height as my fake tree can range from $100 to 175 dollars a tree. That's here in the O-Town of Orlando. I can use that money to buy presents for the family. I got my ornaments from Target, Michael's, and Big Lots. 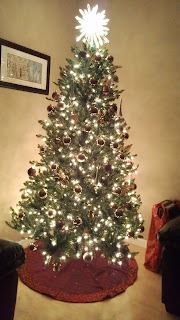 I like to add to it every year, so I'll take some pictures of this years tree to show y'all. When I have children, Gil and I agreed that we'd change our ornaments and do themes for them. Until then I'm happy with the glittery browns, golds, champagnes, and silvers. 5. Last year the babe's and I had an interesting time putting up Christmas lights on our house for the first time. 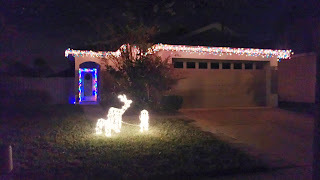 We both really want to put up lights because we hadn't in the past, and our block wasn't very festive. No one had lights up except on house, and that house isn't considered to be apart of our block. So Gil, and I made crazy trips to the store to figure out what we needed to cover our house in lights. Then there was that huge, ugly tree that was awkwardly placed on the side of our house. 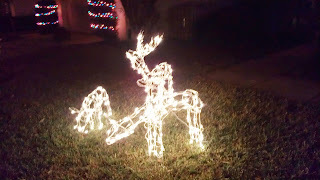 It made it ten times harder to put up lights...lol What a day! 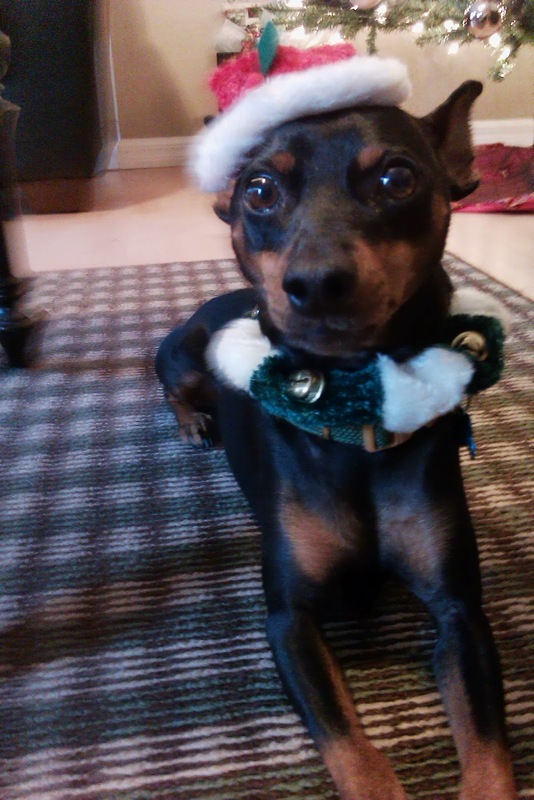 We basically missed the train on outside Christmas decorations as well, because we saw everything at the stores, and decided to get things later. When we went back to the store, everything was gone! So this year we kind of learned from that experience, and Gil got his snowman. 6. 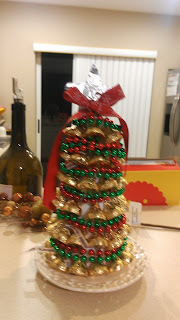 I made this cute tree, which was an amazing find on Pinterest. It was really easy to make, and didn't cost more than $2. Everyone loved it, and by the time the night was over, the tree was more than half way finished. I think I'll make a post on how to make this. Basically you need a cone shaped steraphone, Hershey kisses, double-sided tape, ribbon, beads, etc. Whatever you feel you can add to it. I liked it, because it was so easy. It that time again...time to announce the winner of the Rakun Shop giveaway. 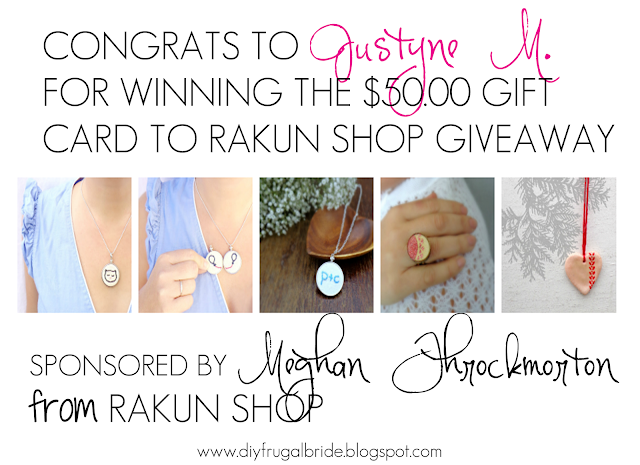 Congrats to #256 Justyne M. has won the $50.00 Gift Card to Rakun Shop! 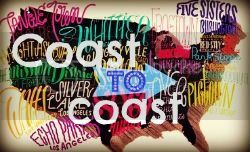 Be respectful of other commenters, and blog author - Meeting differences of opinion with civil discussion encourages multiple perspectives and a positive commenting environment. Don’t feed the trolls - Carefully consider your response if you encounter a user who displays combative behaviors. We reserve the right to remove comments - Comments that we find to be abusive, spammy, off-topic, or harassing may be removed. If for some reason you feel the need to leave a negative comment, all comments are being moderated and will be deleted immediately. Don't waste your time. How WE Roll: To a Happy and Healthy Relationship? 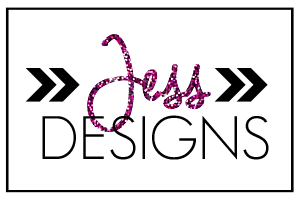 Recent reviews by Jess S.
Design by Jess. Copyright Sleepless in DIY Bride Country.. Simple theme. Powered by Blogger. Sleepless in DIY Bride Country by Jess is licensed under a Creative Commons Attribution-NonCommercial-NoDerivs 3.0 Unported License.